Even good people are becoming bad after entering politics. This is one of the most popular statements one hears, whenever any new person joins politics. I would say that, the perspective is wrong. If a good person enters politics, the general expectation from the people is, he/she will do very good, and changes the entire system. But, in practical, it is not possible, even if that person has been made as Chief Minister or Prime Minister. Because, even if they reach that position, in most of the cases, they will not get full power. He/she would be controlled by many others. Let's take a hypothetical case. You are a very good person who wants to change the entire country. You were chosen to become the Chief Minister. From the second day onwards, you have to listen to the people who made you as CM. They ask you to do all the corrupt things. If you don't do it, then you would be asked to resign. Would you do it or resign to CM post? All the great people did not resign to the post, and they continued. What they have done was, they listened to the controllers for whatever they asked, and fixed everything else that they have not interfered. Whenever they were forced to allow corruption, they allowed it, but, never got benefited from that. But, unfortunately, they had to face the criticisms of the bad things that happened, and media never mentioned the good things that they had done. 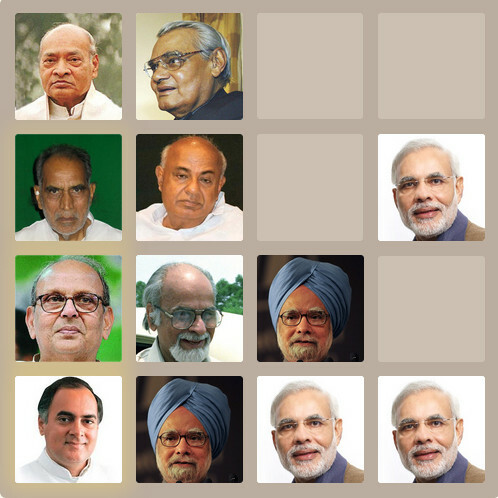 P.V.Narasimha Rao faced so much criticisms for all the scams that happened during his rule. Till his death, everyone considered him only as a corrupted person, and nobody knew about his real achievements. Only after his death, people started realizing that, he is one of the best prime ministers of India who saved India from bankruptcy. In his minority government, when all the people wanted to do corruption, he did not have any other option other than allowing them, but, he made all the economic reforms, which a normal person cannot understand, and saved India. If a policy cannot be explained to your grand mother, then the opposition parties or alliance parties will not oppose it. Since, they won't get anything by opposing it. The great leaders like P.V.Narasimha Rao and Vajpayee used this, and brought many policies which changes a common man's life, but, cannot be explained to an illiterate so easily. Media takes only the points which can be explained to anyone. So, they will be left only with the corrupted activities and bad policies. They project those only which creates bad image for those leaders. That's why, many people are not aware of good politicians, eventhough there are many. Few years back, when I was learning Sanskrit, there was one teacher, who never speaks in any language other than Sanskrit. May be she had taken a vow of not talking in any other language. But, when she is in the role of a teacher to spread the knowledge of Sanskrit, the vow would be a big obstacle. Even if she feels that, she could manage, but the students cannot manage. Among all the teachers I had in Sanskrit, I appreciated everyone who tried their best to give maximum knowledge of Sanskrit. I remember one teacher, when he was explaining one thing in Kannada, I asked him to explain in English. He asked what was my mother tongue, and I told him Telugu. Since then, he started teaching Sanskrit in Kannada and Telugu, eventhough I was the only telugu student there. I appreciate him a lot. If the goal is spreading the Sanskrit, then talking only in Sanskrit may become an obstacle in that. Generally, if a political leader calls the leaders of other parties, then not everyone comes. Most of the time, the main rival parties do not come. When Sakshi TV was inaugurated, Chandrababu did not go, eventhough he was invited. Dr.Jayaprakash Narayan went there, and he gave an extra ordinary speech. It was one of his best speeches. He utilized the opportunity of speaking at the inauguration of a TV channel, spoke about media, and conveyed his message to everyone. You can watch the video or read the transcript from the below links (both are in Telugu). Some time back, Dr.Jayaprakash Narayan was invited for a meeting which was exclusively for Muslims. Many people think that, if anyone wants to abolish caste and religion from the government, then they should try to be as much away from them as possible. From that perspective, they may think that, it is not a good idea for Dr.JP to attend that meeting. But, he attended the meeting, and by the end of the meeting, all the attendees have started supporting him and understood his ideologies. If he has any rule like, not attending the meetings of a specific caste or religion, then he would have missed many people who are ready to learn from him and follow his ideology. If anyone has a higher goal or vision, it is better not to have any rules in that. My classmate worked for a company for 2 years and then she went for higher studies. After her higher studies, she joined back the same company and has been working for the last 7 years. After having experience of 9 years in that company, now, that company wanted to verify her background. She gave her classmate's phone number with whom she studied for 1.5 years in her post graduation 7 years back. That company called her classmate and talked for 10 minutes about her and happily closed the background verification. I cannot find more funny thing than this. If a person has been working for a company for 9 years, still do they need background verification? Working for a company for 9 years is pretty long in the software industry. If a person works for a company for 9 years, then after the employee's family and immediate relatives, the company is the one which would be knowing more about the employee than anybody else. Still, why do they need references of people who know much less about the employee than the company? Do they think that, those who worked with the employee briefly 7 years back can provide better information than the company in which she has been working for the last 7 years? I cannot understand who comes up with this kind of great policies in the corporate world. Change cannot be given to you everytime. You only must bring the change. Where a, b, and c are constants. If you want high job safety, If the no.of employees in the company is very high, then work for your manager (i.e., do what your manager has asked, even if it is not good for the company). If the no.of employees in the company is less, then work for the company. Sometimes, the employees face dilemma whether to do something in the interest of the company or the manager. Manager may say something which is not good for the company. If the employee does not listen to the manager, then the manager may want to get rid of him/her, and the employee's job will not be secure. If the employee just listens to the manager and helps in implementing the bad decisions and finally brings huge losses to the company, then the entire company/project may land in trouble, and everyone in the company/team may lose job. The control that manager has, is directly proportional to the size of the company. If the company is big, then the manager gets more control, and he/she can take decisions at his/her level, or make others to support his/her (even bad) decisions. If the company is small, then he cannot just do whatever he/she wants to do. Also, if the manager is continuously taking bad decisions, then his/her job will be in trouble. If the company is small, and if you are not having regular interactions with the top management, don't think that, they will just listen to your manager and they do not know what you are doing. If the company is big, and if you are having regular interactions with the top management, don't think that, they know what you are doing and they do not listen to your manager. If the company is big, and if you work for the company, then you cannot work for the company. Does Separating Telangana State Solve Law and Order Problem? For those who prefers to have Telangana state just to escape this law and order problem in A.P., they should know that, if Telanagana state comes with Hyderabad as part of it, then there will be another movement for separate Hyderabad state/union territory. If Hyderabad is made as a separate state/union territory while giving Telangana state, then there will be another movement to merge Hyderabad into Telangana. Separation of the state will not solve the law and order problem. It is better to take the correct decision rather than trying to solve the problems created by the stupid politicians.